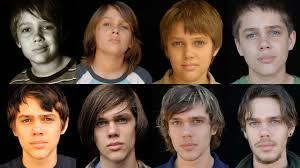 boyhood is like slowfood « AFTER THE POP ! i was enchanted by the film “boyhood” directed by richard linklater as i watched it yesterday and a couple of things certainly jumped out at me – pacing and content. the first and very noticeable was my own jittery feeling at the pace and the length of the film. the content was abundant and flavorful, but my own anxious reaction was a point of curiosity. and the second delicious and familiar experiential are the truth and wisdom that evolve through the years by just living life itself. the film was made over a period of 12 years and the cast and the script evolved and changed with time even though intention remained the same. just like a family holiday dinner, i believe that the ritual of making the film created its own ritual quality that became a supporting character in the film just as it becomes a ritual in an actual family. i had no doubt that the reality of comfort grew into its own as the storyline grew with its characters. this is a good film. this is a wonderful idea. this is worth your time. this is evolution. this is film making growing up a little. this made me want to slow down a bit. and it reminded me that life doesn’t always give us the family we want. we get the family we get and we have to find a way to make that fit. This entry was posted in family, film and tagged childhood, emotional sobriety, film, growing up, movies, second stage sobriety, slow food, stage 2 recovery.